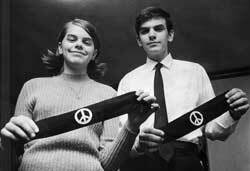 Forty-one years ago, 13-year old Mary Beth Tinker and her 15-year old brother John wore black armbands to school in Des Moines, Iowa. They wanted to show their mourning for people killed in the Vietnam War and their support for a truce at Christmas. A student with a perfect attendance record in eighth grade at Harding Jr. High School, Mary Beth was promptly suspended by her principal, who said no black armbands would be allowed. Mary Beth stood her ground. Even as her family received death threats and someone threw red paint on her front door, she insisted that she had a right to make a political statement at school. Four years later, in Tinker v. Des Moines School District, the Supreme Court agreed, holding that students (and teachers) have First Amendment rights at school even during wartime. Student speech is protected unless it threatens to "substantially" disrupt the educational process or violate other students' rights. Justice Fortas made clear that, far from being disruptive, Mary Beth's kind of expression-political, respectful, nonviolent-enriched the learning environment. Americans who go abroad recognize how extraordinary the Tinker decision is. Even in France, a nation that cherishes freedom of expression, public school students are forbidden to make religious or political statements at school through their dress. (This is why France banned the Muslim headscarf.) Students are supposed to listen and take notes, period. Although our Supreme Court has somewhat cut back on the rights of students since 1969, the Tinker decision is still a towering constitutional landmark. Under our First Amendment, students have a right to speak truth to power, to tell grown-ups that the Emperor has no clothes. This fall, we have the chance as a society to celebrate the value of student expression. Because of the leadership of Senator Robert Byrd (D-WV), who keeps a miniature copy of the Constitution in his pocket, a new federal law requires public and private schools and universities that receive federal funding to observe Constitution Day, this year on Monday, September 18. Importantly, the law leaves it up to schools and students to decide how to participate in the observance. Teaching the Constitution does not have to be boring. On the contrary, Senator Byrd's alma mater, American University Washington College of Law, has taken the lead in showing that the promotion of constitutional understanding can be thrilling to students all year long. Through the Marshall-Brennan Constitutional Literacy Project, the law school sends law students into public schools to teach the Constitution and to lead discussions of the cases that resonate most in the lives of young people. To find out more, go to http://www.wcl.american.edu/wethestudents/. The black armband has become a national symbol of respect for student rights. On Constitution Day this year, the Marshall-Brennan project, which has spread to law schools at Rutgers, Howard, Arizona State and the University of Pennsylvania, will be distributing black armbands to schools, teachers and students. We will encourage lively conversations about the state of student rights and civil liberties across America. We will be wearing our Tinker armbands on September 18 and hope you join us. You can make your own armband, just like Mary Beth did, by tying a piece of cloth around your forearm. Let us send the message that students have First Amendment rights and we honor the voices and viewpoints that students have to offer. Jamin Raskin is a professor of Constitutional Law and the First Amendment at American University Washington College of Law and author of We the Students: Supreme Court Cases for and About Students. "On Constitution Day, join Mary Beth Tinker and wear your heart on your sleeve." The History of Voting: Who can Vote? Teaching Module: The Fifth Amendment's Privilege Against Self-Incrimination and Public School Students: When do Miranda Rights Apply?